Chop, saw, and dig with a root trowel that does it all. Its carbon steel blade is shaped like an inverted V and is lined with 24 rip-saw teeth that make quick work of roots you might encounter while gardening. The lightweight trowel has an ergonomic handle to feel good while you’re at work, and is guaranteed to last a lifetime. 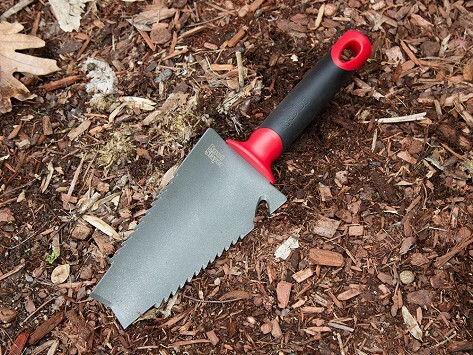 Dimensions: 13" x 3.75" x 2.5"
This trowel cuts through roots and caliche soil very well. The grip is comfortable, too. This is a smart design with the ridges for cutting through hard dirt and roots. I love it, works perfectly without too much force needed. Great for those of us who aren’t super strong.